A few of The Springs at Wilsonville’s committed staff members (l) Tonya Harrington, memory care administrator, Doreen Bullock, medication tech, and Michelle Mead-Vlahos, staffing coordinator. Administrators and staff members of assisted living and memory care communities appreciate the support that comes with having Housecall Providers as a trusted partner. While our focus is to deliver excellent patient-centered care to their residents, we also lend our expertise to support the staff as they help family members comprehend health changes or other challenges a loved one might be facing. 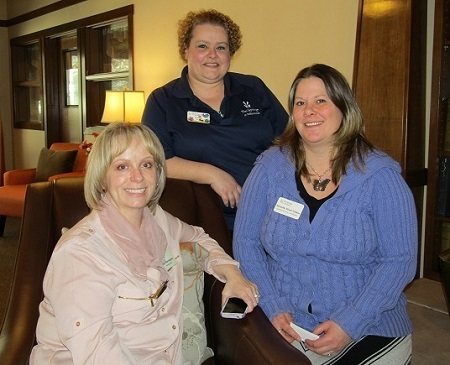 Tonya Harrington, memory care administrator at The Springs at Wilsonville, recalls a time when Housecall Providers Medical Director Dr. Pam Miner stepped in to advocate for a patient while helping a daughter come to terms with her mother’s mortality. “We had a resident who was on hospice due to a severe case of chronic heart failure. Dr. Miner was so helpful, especially at our care conferences, assisting the family member in understanding the reality of the situation. She explained the uses of specific medications and why a certain course of action was timely and appropriate. We were all very grateful for her counsel,” Harrington said. Housecall Providers currently has 13 patients at The Springs at Wilsonville, who are seen monthly by family nurse practitioner, Natalya Balanetskaya. The community features two assisted living units, one of which caters to the more independent resident, as well as two memory care units.